Arrow, The Flash and Legends of Tomorrow showrunner Greg Berlanti will produce a feature film teaming Blue Beetle and Booster Gold, The Tracking Board reports. El Mayimbe, founder of Heroic Hollywood, tweeted out the article, implicitly giving it his stamp of approval after building to "big DC news" coming up this hour. He later followed up with an article saying that Zak Penn of X2: X-Men United and Marvel's The Avengers fame is being eyed to write. Booster Gold is a time-traveling hero from the 25th Century who, after being publicly disgraced in his own time, traveled to the past for a shot at redemption. Blue Beetle is a genius inventor who took on the mantle -- but not the powers -- of his heroic mentor and college professor, the Golden Age Blue Beetle Dan Garrett. Garrett wore a scarab that granted the bearer powers, but Ted Kord relied on his wits, martial arts training and engineering skills to make it as a hero. Each of the two had their own ongoing series shortly after the Crisis on Infinite Earths thirty years ago, which were then cancelled and the pair ended up on the Justice League during Keith Giffen, J.M. DeMatteis and Kevin Maguire's run. It was during this time that they became inseparable. DeMatteis has often referred to them as the "Laurel and Hardy of the superhero set." That comic sensibility will reportedly be on display in the Blue and Gold movie, according to TTB. In the comics, Booster Gold's son is Rip Hunter, the Time Master who is at the center of Berlanti's forthcoming CW series DC's Legends of Tomorrow. 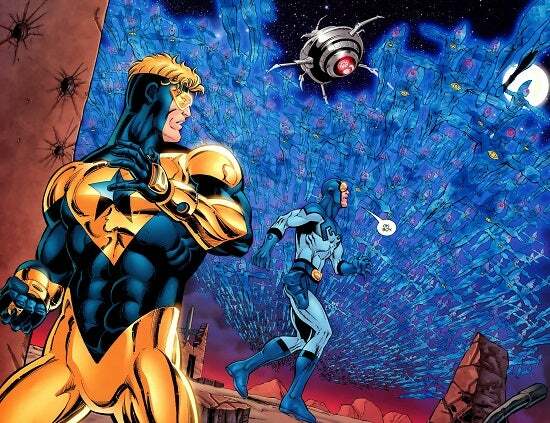 Syfy had originally optioned Booster Gold for a series, which never made it to pilot. Legends of Tomorrow producer Andrew Kreisberg was to have written the script and produced the series. Long ago, Booster Gold was rumored to be in development as one of a number of mid-budget films including Suicide Squad meant to keep the DC brand alive in between Justice League-themed mega-blockbusters. More recently, Legends of Tomorrow executive producer Phil Klemmer said that Booster wasn't going to be on the show because there were bigger things in store for the character. Very recently, Nathan Fillion went viral after telling an audience at Wizard World Chicago that he would like to play Booster Gold.